Parker’s patent pending Heavy Oil Gas Extraction Technology (“HOGE”) is a technology that is relatively inexpensive and with no foreseeable environmental impact. 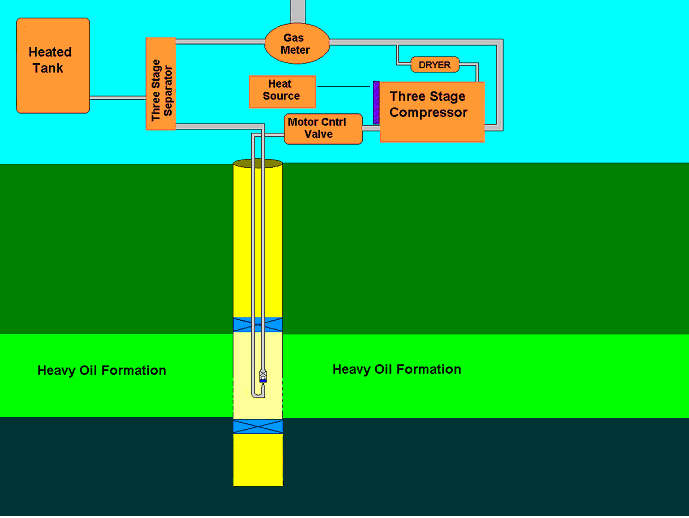 HOGE is designed to extract heavy oil from formations such as tar/oil sands with a calculated recovery of 90% or more. The process mechanically injects hot natural gas delivered deep into the formation by a proprietary tool that liquifies the heavy tar oil and then extracts it to heated storage tanks on the surface. The heavy oil formation is injected until a sufficient amount of recoverable heavy oil is heated to 300 degrees F, then oil & gas are produced until production temperatures drop below 200 degrees F. Upon completion, the injection cycle is started again. HOGE has the capability of producing over 200 bbls per day but our projections are based on a conservative 50 bbls a day.